I did not cry for the last memory of him. No … I told my mother he was gone and then went to play basketball. “How can you do that?” she asked me as I left. But I didn’t answer her, just walked away. I did not want to cry for his death, his passing. I wanted to remember him happy and full of life. Our lives had always been intertwined somehow as if we had planned it that way before this life. He was here to guide me spiritually. The day I was born he was there, but not in the way you would think. Rather, on that day in 1975 he was, in the same hospital, having a heart attack. He had been told in a spiritual blessing that should he live righteously he would live to see all his children married – his youngest was seven-years-old the day of my birth. Yet, even with such a heavenly promise my grandfather had to fight for his life everyday he lived. I believe that on the day of my birth he fought for me. I know I was afraid to enter this life. I was afraid to fail, afraid to succeed. My grandfather’s spirit touched mine that day to let me know he would be there for me every step of the way. But … 18 years later he died. He left me. No … I did not cry for the last memory of him … until fourteen years later. On a cold day in May 2008, I pulled the car over on a lonely stretch of highway while returning to my new home in Albuquerque and cried for my loss. I wept for my guide, my grandfather. I needed my grandfather’s calming voice to tell me everything would be okay. I needed him to help me know how to raise my two young children and be a good father to them. I’m not a good husband because I’m lazy, selfish, and very unreasonable. My grandfather was a good example for me, but regardless of how much I tried, his example was fading from my memory. I know you’re thinking that makes me a horrible person, but you cannot deny that it happens to all of us. We forget the best people in our lives when it’s easier not to remember we aren’t keeping up to that example. And it was on this uncharacteristically chilly day that I gave in to my fears that I was truly losing him. It was harder to remember his face, his smile, and how he made you want to be better than what you were. Time was hurting me, eating away at the memory in my mind where I kept him locked safely away. The weeping could not be helped because it had built up over the years. On this day, fourteen years later, I understood what my mother had felt, why she was so enraged that I could walk away during such a moment. But how could I have handled such pain, such anger, while just a teenager? I couldn’t have, so I did what I knew how then and ignored it. Today was different and I was unsure what had brought me to this moment of lament so abruptly. I could not see a reason; therefore, I gathered myself and once again ignored it. My grandfather taught me how to golf as a young boy, dragging me around the course on hot, sweaty days. Not quite an old man then, but walking slower due to many more heart attacks – seven minor or major before his death. I loved him more than you could know because he let me be who I wanted to be, no matter how crazy. He knew the real me would come out and I would return to the teachings of my youth if he gave me the chance. Now I cry when I think of him, and he would say that’s okay – real men show emotion for their family. My grandfather was calm and funny, but he stood for his rights, and at just over five feet tall he was larger than life. He loved buttery grits for breakfast and a Pepsi with dinner. My dad’s fast driving in a big city made him nervous, but he trusted my dad with my mother’s heart and that never faltered over the years. He enjoyed country music, but loved listening to my sister sing, even when the rest of us were tired of it. I’m sure he heard her voice at his funeral rising to the heavens for him. Cousin Jacob still keeps the old golf clubs Grandpa used and lets me use them when I come to town – I’m honored to use them. I’m honored to have known my grandfather for a short time and now, 19 years after he left us, I no longer ignore the pain and the anger of his death because … his memory drives me forward in life. You see, I was trying to remember his face, his laugh, or the look in his eyes, but that is gone after so many years. It is the good feelings and instincts he left me with – that I ignored for so long – that is the true memory of my grandfather. So when you remember your ancestors, you cannot just picture them in your mind … you must feel their memory. 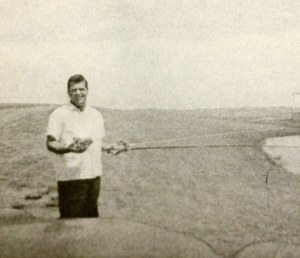 My maternal grandfather, Karl Conner, going fishing – one of his favorite hobbies. My grandfather in his mid 20′s as a member of the Army Air Corp (Air Force). My grandfather and grandmother, Juanita, with the three oldest (Tom, Karla, Carol) of their seven children.